Recently at Mobile World Congress, we were invited by Laureen Cook of Alcatel Lucent to the Global Telecom Women’s Network power breakfast. She didn’t tell us much about it except that we had to get up early. 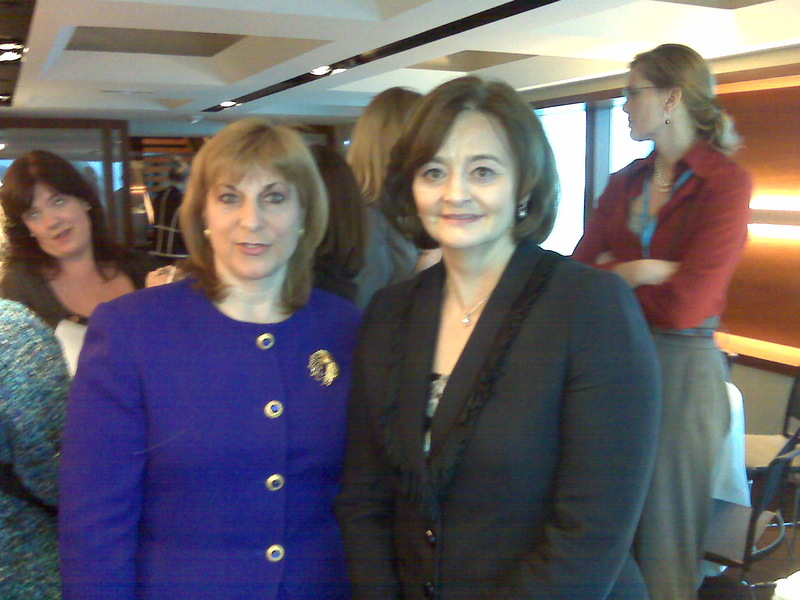 So you can imagine our surprise to find that one of our keynote panelists was the former first lady of Great Britain, Cherie Blair. Since leaving 10 Downing St, she has created her own foundation for women entrepreneurship. So what was the connection to MWC? Her foundation had recently funded a market report on the gender gap on mobile phone ownership in low income countries and the socio-economic opportunities that this market represents. I find it hard to imagine that there are places where high tech is a lowly mobile phone – not even a smart phone, mind you. And on one hand, it seems backwards, but on the other, I kind of like the idea of my computing experience evolving from my phone vs the pc and being able to by-pass the legacy that comes with it. Partners are an important part of our entry into supporting virtualization and hyper-visor technologies. The recently released RTS Hypervisor 2.2 enables customers to run the QNX Neutrino RTOS on the same hardware as Windows, Linux, and other operating systems. This hardware consolidation not only reduces power consumption, but also reduces system costs by eliminating the need for additional processors. We’ll be demonstrating the RTS Hypervisor on an Advantech system on module, SOM-6760, at Embedded World in Germany next week. Come check us out in Hall 11. QNX CAR isn’t the only QNX reference platform traveling the world these days. 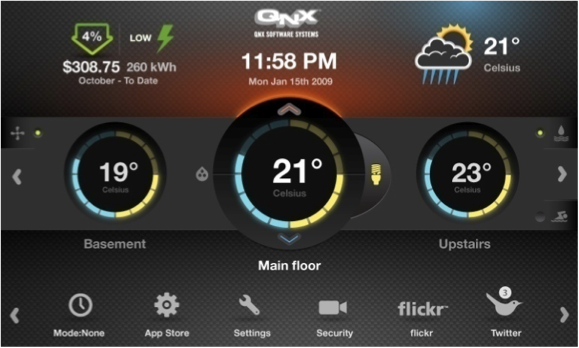 The team at QNX has been busy developing a Smart Meter Reference. There’s a new class of devices in the industrial segment that are now demanding enhanced graphics, connectivity, sophisticated human machine interfaces, audio and even high definition video. Sounds a lot like an infotainment system to me. Lucky for us, we’ve already done the heavy lifting. The Smart Meter Reference takes many of the technologies being developed for QNX CAR and applies them to a key element in the new green world. It combines a snazzy HMI with real time video and touch screen technology. I actually can’t wait to have one of these in my house. So long thermostat – hello complete multi-zone control. Of course, it will point out how much electricity I waste but maybe that’s a good thing. The Smart Meter reference, running on the Freescale i.MX25 application processor, will be visiting at the China Smart Grid Conference in Beijing on March 25th and 26th. Check it out if you can. 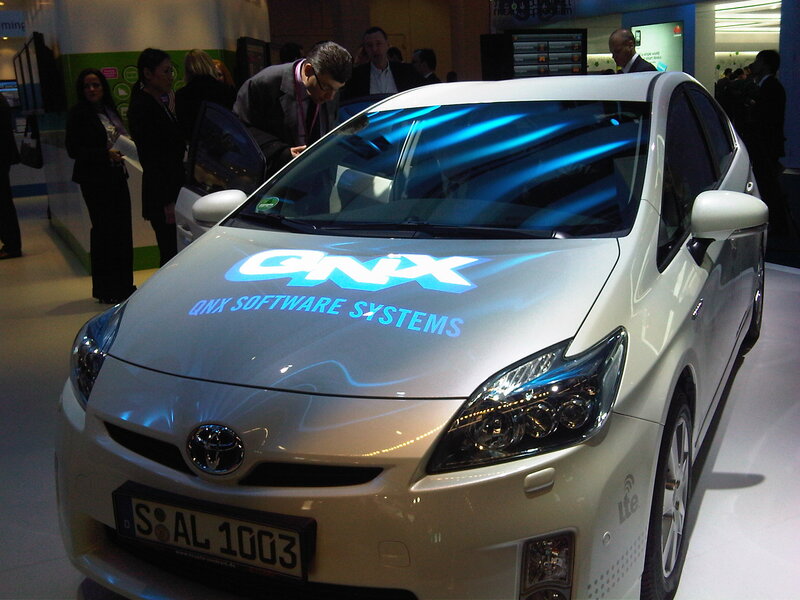 QNX at Mobile World Congress in Barcelona – a first! The Mobile World Congress is on this week in Barcelona. This is not typically a show in which we participate given its focus on handsets. However, this year we were there as part of the Alcatel Lucent stand. The ngConnect LTE connected car was the hit of the show, or at the very least, the hit of their stand 🙂 Halfway through day one, ALU had to hire a security guard because people kept jumping in the car from the aisles which conflicted with the schedule of 800 customer demos that were planned. Unbelievable! Service providers from across the globe had a chance to experience first hand what LTE connectivity combined with a compelling set of apps running on an auto-grade universal application platform will do to change the driving experience and create demand for new connected services in the future. Now… all they need to do is invest in the necessary infrastructure and figure out their business models and the rest of us will be all set to take our connected lives onto the road with us. 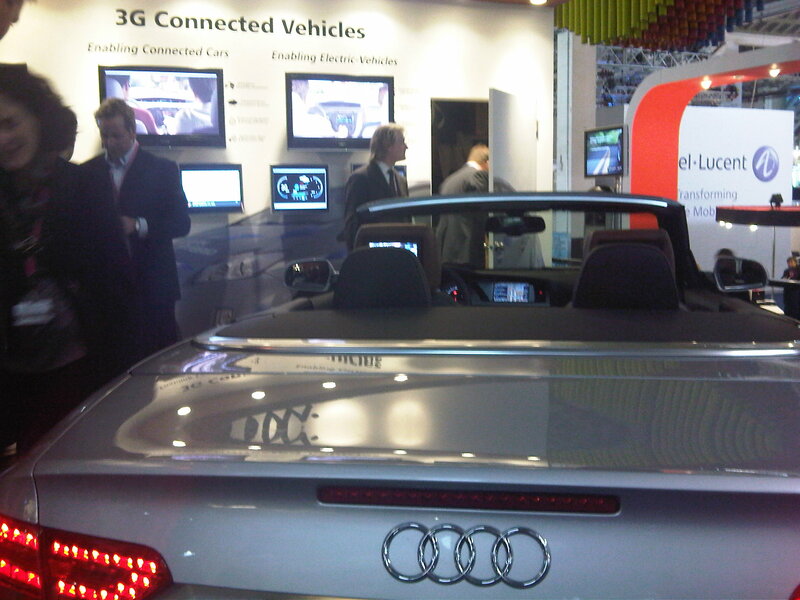 Here is a picture of our LTE Connected Car at CES earlier this year. This car was built by a number of companies through the ngConnect ecosystem. For more info on ngConnect, go to www.ngconnect.org. The car was displayed in a ballroom at the Venetian. 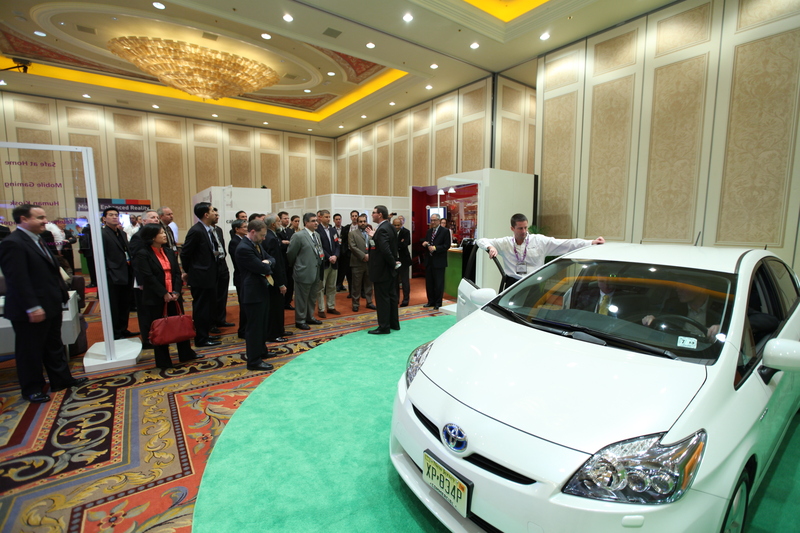 One of the pics shows an ALU exec presenting the car to a group of visitors. If you look closely, there are some people in the car getting a demo. The person sitting in the driver’s seat (both literally and figuratively) is none other than QNX CEO/CTO, Dan Dodge. You are currently browsing the Tertiary Matters blog archives for February, 2010.